Since 1947, the University of North Carolina Wilmington has been recognized via a variety of symbols and designs as well as words, phrases and letters that identify the university and symbolize its mission, values and traditions. To protect ownership of its intellectual property, UNCW has developed policies and procedures regarding the use of its name and marks. Per our licensing policy, any vendor producing products imprinted with our indicia will need to become a licensed vendor. Both internal (on-campus departments) and external (bookstore, retail locations) orders require a license. 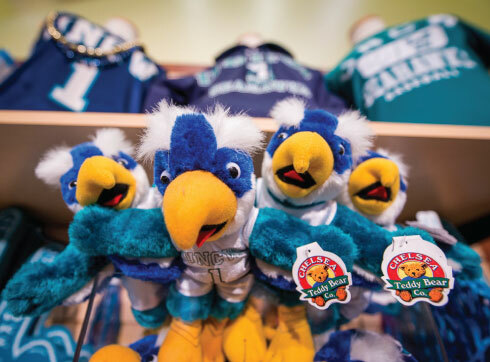 UNCW's collegiate licensing partner, Learfield Licensing Partners (LLP), administers the licensing process on our behalf; in addition to the collection of royalties, enforcing trademarks and pursuing new marketing opportunities for the University. Please visit their website (http://learfieldlicensing.com/licensing/) for general information regarding Learfield Licensing Partners.